Perhaps the "fountain of youth," always associated with the name Ponce de Leon, is one of the numerous springs found in this 443-acre park in Holmes and Walton counties. The main spring found in the park is actually the coming together of two flows from a limestone cavity. These two flows produce more than 14 million gallons of crystal-clear water daily. Inevitably, a youthful glow will follow a dip in the spring because its temperature remains a constant 68 degrees. The spring's coolness is refreshing when summer temperatures soar, and the temperature is a warming contrast as the thermometer begins to fall. 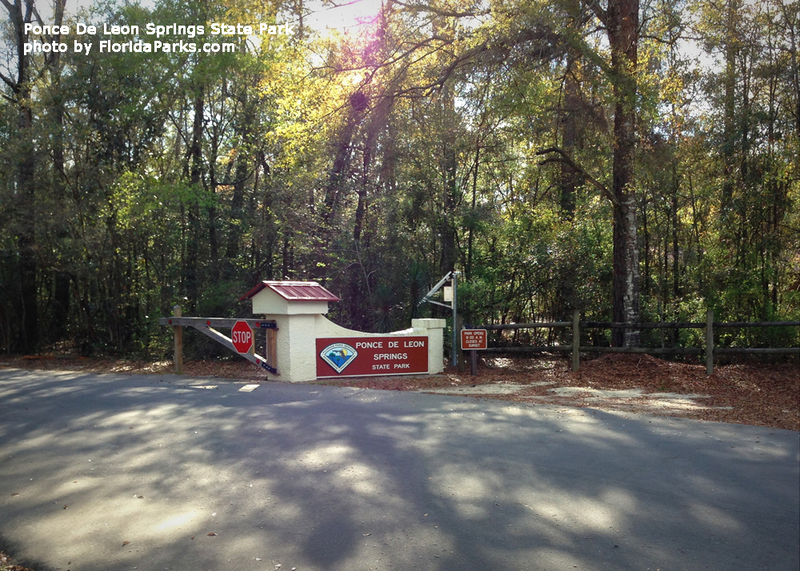 Ponce de Leon Springs State Park Area is located one half mile south of U.S. 90 on C.R,181-A. Fishing is permitted in areas not designated for swimming. Otherwise throw your pole in and watch your cork to see if your efforts are to be rewarded with catches of catfish, largemouth bass, chain pickerel and panfish. If watching closely you can actually see the fish come to the bait. Take a stroll down the two trails of the park, Sandy Creek and Spring Run. Each trail will take you through a lush hardwood forest, which provides optimum vantage points for observing wildlife along the 350-foot spring run and Sandy Creek. As well as, a relaxing stroll among a variety of native plant and animal habitat, where you can listen to the relaxing sounds of the flowing stream or conversation of the birds. Rangers also conduct seasonal guided walks, but self-guided tours are also available. After you have worked up an appetite splashing around in the cool spring water and walking the nature trails, it is time for lunch. Approximately 20 acres have been enhanced with amenities for visitors. Four picnic shelters with grills are available for reservation, and numerous picnic tables are available on the grounds for anyone who wishes to stop in for a short picnic lunch, or spend the day swimming and relaxing in the park. Your grill is also welcome for that special cookout. On those sweltering days of summer, regain your youth by taking a dip in the cool crystal clear waters of Ponce De Leon Springs where the water temperature remains a constant 68 degrees year round. You may not get any younger but the water is sure to invigorate. The park has a large bathroom facility complete with changing rooms for your convenience.